Each and every bridal collection from Verragio includes engagement settings crafted in the micropave style. The delicate beauties are at once contemporary and antique-looking. A micropave engagement ring is neat and clean, feminine and impressive. Pieces are, as the name implies, paved with closely-set, very small diamonds that give the illusion of a solid diamond surface. There are many ways to incorporate micropave into an engagement setting. The small stones can enhance a center stone, making it look bigger in a halo. 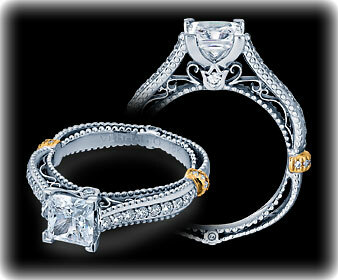 They can also be used to embellish a band, with breathtaking results, and enhance a profile for optimum prettiness. Check out the micropave engagement mountings from Verragio that feature round- and princess-shaped center stones; they incorporate these small stones that have big appeal with some other visually interesting features. The Parisian collection is highlighted by French bead detail. A facet of the Insignia collection is a split shank band. A twisted shank enhances the Venetian collection. The Couture collection has two-tone elements, showcasing the best combination of precious metals. The Paradiso collection has elements of scrollwork. A Verragio micropave setting minimizes visible metal and maximizes a mounting’s wow factor!